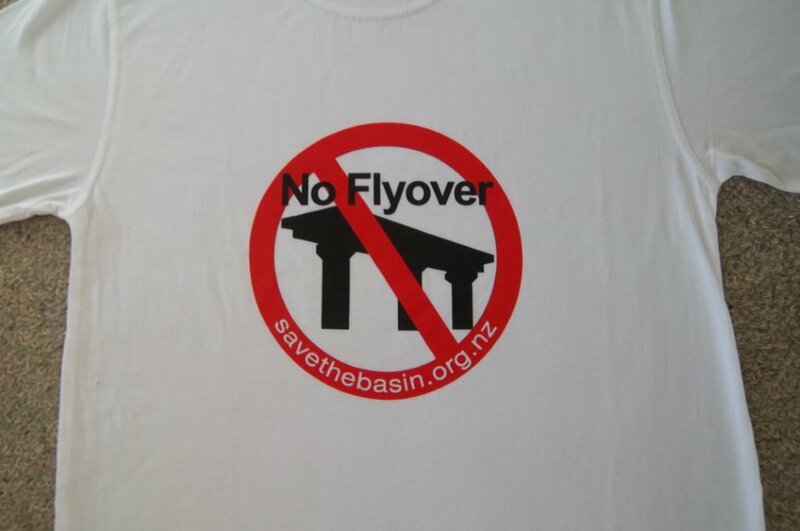 Want to look good, spread the “No Flyover” message and help us raise money? 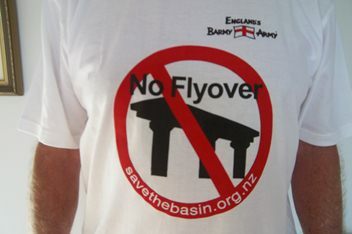 Then buy a “No Flyover” T-shirt (standard or Barmy Army-branded) from the Save the Basin Campaign. Or take advantage of our special offer on orders of 2 standard Ts! 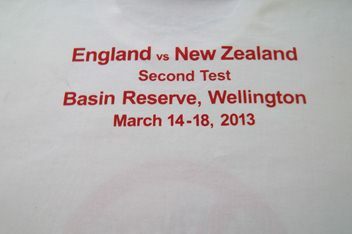 We have two types of “No Flyover” T-shirt available for sale: Standard, with the “No Flyover” image on the front, and the special Barmy Army-branded March 2013 Basin Test souvenir edition, with the Barmy Army logo and the dates of the March 2013 NZ v England Test at the Basin on the back, and the “No Flyover” logo on the front. With our “ print my logo” campaign going on, it is the perfect time to try stuff out! The information below relates to ordering Standard and Souvenir Ts directly from Save the Basin. Please specify the size(s) you want in your order. Please email your order to stoptheflyover@gmail.com with the subject line “T-shirt order”. For overseas orders, send your request to stoptheflyover@gmail.com, and give your address details.A quote for the P&P will be emailed to you. In the reference fields, please include your name and “T Shirt”. Important note: Orders will not be sent until payment has been received. This is an easy way to spread the message while looking good and helping us financially. We look forwards to your order!